Personally this was the Turning Point in my career as trader. Market moves up when Bids hit the current price. 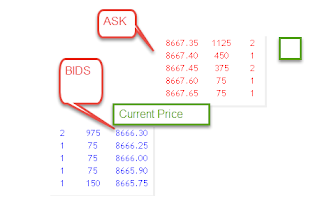 Moves Down when Ask hit the current price. 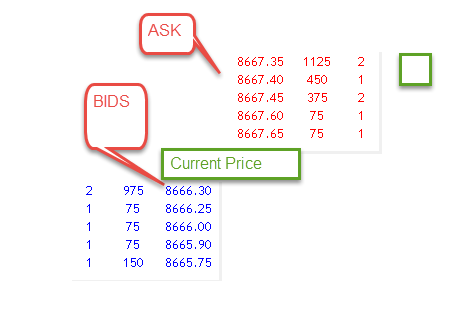 Excessive imbalance in Bids / Ask so that Market makes a Accelerated move. Who are Responsible for this ? Market Consists of Day Trades, Market Makers, Long Term Traders. For Our DP system we are interested in Day Traders. Market Makers are not bothered how market moves they are paid by stock exchange for stabilizing market. To avoid crash moves. Long Term Traders are seen occasionally (During Type 1 day). Non Random move happen till Next DP this could be BOF/BPB. This happens for Just 1-2 Times in a day and for a very less Duration. Rest 80% of time you have to practice waiting. Learn the art of waiting. 80% of your work is to wait. You have to do this properly. This has to suite you personality. System is not for restless person. Go through your trade logs if you are taking more than 2 trade on average per day you are not practicing patience. Hope I am able to convey why Patience/Waiting is important in this system. By Waiting I mean focused waiting. Wonderful.... U r very good in writing.